Inspired and designed from endurance and GT racing in Japan, HKS developed its Hi-Power Exhaust system for both turbocharged and naturally aspirated applications. HKS has incorporated this new race inspired offset muffler and piping design into many street applications, which offers a greater flow and higher-RPM power gains due to the less restrictive design. This is achieved by eliminating unnecessary bends for the straightest exhaust path. For turbocharged applications, the large and smooth exhaust flow allows greater exhaust velocity for better mid-range boost response and high-RPM power. Naturally aspirated vehicles also benefit from greater exhaust flow capacity as engine tuning levels increase. 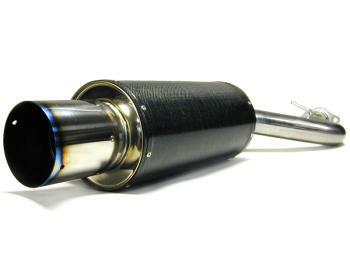 These exclusive versions of the Hi-Power Exhaust consist of a carbon fiber wrapped muffler shell, titanium tip, and polished SUS304 stainless steel piping.